How to think about energy. How to think about electric charge. How to use strategies such as the black-box approach, reductionism, abstraction, et cetera. These ideas get used throughout science and engineering. They are very deep ideas, but you can understand quite a lot about them as easily as you can understand waves on a rope. The wave travels from west to east and does not return. Each bit of rope wiggles in the north/south direction and returns to its starting point. Also note that the wave needs to be carried by “some” medium. The wave cannot just propagate off the end of the rope into empty space. On the other hand, the wave it is not picky about the details of the medium. In figure 1, the left part of the medium is made of polyester rope, while the right half is made of brass chain. Figure 2 is a close-up of the splice. The wave travels from rope to chain, which are dramatically different materials, yet we recognize it as being the same wave. When we talk about “the” physics of the situation, we mean to describe what happens. This is entirely under the control of Mother Nature. For example, in figure 1, the wave is what it is and does what it does ... and nothing you say about it is going to change any of that. However, physics is also about finding smart ways of thinking about what happens. This is largely under the control of physicists. This is where the creativity comes in. For this particular type of wave, there is a concrete, tangible medium. Each piece of rope has a mass and a velocity and a temperature of its own. However, this is not the general case. For some other types of wave, such as electromagnetic waves, the medium is completely abstract. The medium has no velocity of its own. The waves carried by the electromagnetic field have a velocity, but the field itself does not. Sometimes it pays to take the “black box” approach. In our example, rather than saying the wave is carried by the rope and/or carried by the chain, it helps to say the wave is carried by the medium. There is just one medium in figure 1. The medium has a few outside-the-box properties that are important to the wave (such as mass per unit length, and tension) ... plus innumerable inside-the-box properties that aren’t important. We are allowed to look inside the black box if we want to, but we are not required to. As another way of describing the same process, we speak of introducing a layer of abstraction. In figure 1, the idea of a uniform medium is an abstraction. This stands in contrast to the rope and the chain, which are not abstract at all. According to the reductionist viewpoint, a wave is “really” just a bunch of rope-particles or chain-particles moving up and down. Also note that the wave cannot exist separately from the medium. From the extreme reductionist viewpoint, there is no such thing as a wave; there is just a rope or chain wiggling ways that conspire to make us think there is a wave. From a non-extreme, moderately-reductionist viewpoint, we accept that the wave is carried by the rope or chain ... but we also recognize that the wave is a wave. The moderately reductionist viewpoint is sometimes useful but sometimes not. No matter what viewpoint you take, the wave has properties that transcend its embodiment in a particular medium. Over on one side of the room the wave is a bunch of rope-particles moving up and down. Then it propagates over to the other side of the room and becomes a bunch of chain-particles moving up and down. However, we still recognize it as the same wave. The wave is the same, even though the medium has changed. Most (but not all) properties of the medium are completely different. Furthermore, the wave propagates from left to right, even though the medium does not move from left to right. The medium ends up exactly where it started. We can talk about the velocity of the wave, even though no part of the medium is moving with that velocity except possibly by accident. The wave is an abstraction. The wave has properties of its own, separate from the properties of the medium. We can continue the reductionist process quite a ways, step after step. The wave is made of rope, the rope is made of organic molecules, the molecules are made of atoms, the atoms are made of subatomic particles, and so forth. Saying there is no such thing as a wave is just a silly as saying there is no such thing as a rope. The reductionist viewpoint is sometimes helpful as a way of looking at things – but it is not the only way of looking at things. You can take the reductionist viewpoint if and when you like. On the other hand, you would be tragically limiting yourself if that were the only viewpoint you were able to take. You are free to choose whatever viewpoint(s) you like, but remember that other folks are free to choose differently. In section 2.2 we moved from big to small: The wave is made of rope, and the rope is made of atoms, et cetera. We can also analyze things the other way around: Starting with atoms, we can put atoms together to make a rope. Continuing from there, we can consider waves on the rope. In particular, consider the wave shown in figure 1. It is diagrammed in figure 3. The wave is an organized, collective motion of the atoms. The wave has some collective properties, such as its shape and its energy, that remain more-or-less constant as it propagates along. The wave is not a property of any individual atom by itself, but rather a an emergent property, i.e. a property of all the atoms collectively. Any given piece of rope can support multiple waves at the same time: some wiggles here, some wiggles there, some propagating in different directions. Mathematically, this is represented as a field. We say any such wave is an excitation of the field. I mention this because sometimes people try to argue that tangible material things like electrons, atoms, and ropes are real, but waves are not real; the wave is (allegedly) “just” an abstract collective motion of the rope. Well, that is just completely wrong physics. In reality, according to any modern understanding of physics, the electron itself is a quantized excitation of a certain field ... just as the wave in figure 3 is an excitation of the rope’s displacement field. Waves exist at both the top and the bottom of the constructive/reductive hierarchy, as shown in figure 4. If you don’t think waves are real, then nothing is real. A great deal of physics is representational. We build models that represent the physics. The representation may involve some combination of equations, pictures, computer programs, tangible mechanical models, et cetera. The question is not whether or not to build models; we are going to build models. The only questions are to what extent this-or-that model is convenient, and to what extent it is faithful to the underlying reality. In a fictional world, anything is possible, including six-foot-tall flying unicorns, energy non-conservation, et cetera. In the real world, things behave according to very strict natural laws. These laws are not of our choosing (although we get to choose how to represent and/or approximate them). Abstract is the opposite of concrete; it is not the opposite of real. The relationships are spelled out in figure 5. To my way of looking at it, waves are real. I don’t care whether the waves are tangible or even visible; the important point is that waves are created, propagated, and destroyed according to strict natural laws. Ropes are also real. Of course they can be created from scratch, they can be destroyed, and they can behave in complicated ways – but only according to natural laws. The same goes for energy, as discussed in section 4.1. Energy is just as real as waves, and as real as ropes. Energy may be intangible and almost invisible, but it obeys laws that are simple, strict, and very well understood. Electrical charge is an abstraction. Electric field lines are an abstraction. As a simple example, consider the energy in the wave in figure 3. The energy flows from left to right, even though the rope does not. Even though energy is an abstraction (as discussed in section 4.1), and flow is an abstraction (as discussed in section 4.3), the laws of physics give us some interesting information about such things, some very definite, important information. Another example concerns electrical charge. This is definitely an abstraction. As discussed in section 4.4, tangible, material particles are not conserved, but the abstraction – charge itself – is conserved. If you focus on the tangible, material things, you are going to miss the important fundamental physics. There are two ways of looking at the situation, as you can see by comparing figure 6 with figure 7. 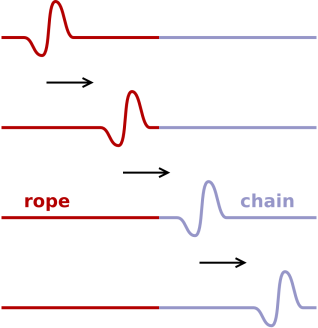 As indicated in figure 6, we could think of a “wave on a rope” and a “wave on a chain” as being two separate things. 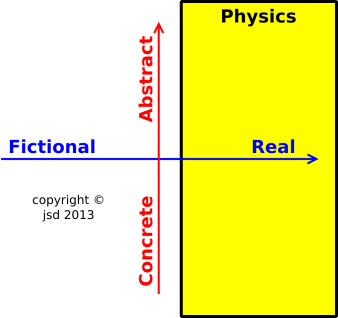 However, as indicated in figure 7, life is simpler if we introduce a layer of abstraction. We think of a single wave carried by a single medium, even though part of the medium is made of rope and part of the medium is made of chain. Let’s be clear: This abstraction makes things simpler. It reduces the number of things you need to learn. It means you do not need to worry about the details of the substances that make up the medium. You are allowed to look into the details, but you are not required to. Abstract does not mean complicated. Abstract does not mean abstruse or incomprehensible. Abstract does not mean irrelevant or disconnected from real life. As another way of saying the same thing, the idea of a “wave on a medium” is a generalization of the ideas of “wave on a rope” and “wave on a chain”. The more-general idea is more powerful and more useful. People are really good at this sort of thing. Consider a four-year-old child playing with a baby doll. Everybody knows it’s not a real baby; it is a symbol that represents a baby. The most elementary idea of counting depends on this sort of generalization and abstraction. You start with the idea of four cows, four pots, or four chairs ... and then generalize to the idea of four itself, i.e. the idea of four abstract things. Four pots is different from four chairs in some important ways, but it is also the same in some important ways. In physics, many of the most fundamental concepts are completely abstract. This includes energy, momentum, and electric charge, among other things. The medium wiggles north/south as the wave passes, and then returns to its initial state. The wave flows from west to east and never returns. The terminology of a “different plane of existence” comes from eastern mysticism, but there is nothing mystical about what we are saying about waves. This is hard-core quantitative physics. There are many forms of energy. Sometimes it is embodied in the gravitational potential energy of objects. Sometimes it is embodied in the kinetic energy of objects. Sometimes it is embodied in electromagnetic radiation. However, as far as we know, energy never exists in isolation; it cannot exist separately from some sort of embodiment. Still, energy has important properties that transcend any particular embodiment. Just as a wave in figure 3 can propagate from the rope to the chain and still be recognized as the same wave, energy can flow from the rope to the chain and still be recognized as the same energy. As another way of visualizing the same thing, consider figure 8. (Video courtesy of GiantNewtonsCradle.com.) Initially there is some energy in ball #1. The energy then flows through ball #2, ball #3, and ball #4 without accumulating there. It accumulates in ball #5, which goes flying. The net effect is that energy has flowed out of ball #1 and flowed into ball #5. Even though the energy is embodied in a completely different ball, we recognize it as the same energy. Some people loudly insist that energy is not a “thing”. That indicates a remarkable non-understanding of what energy is, and/or what a thing is. Energy is an abstract thing. It is not a tangible material thing, but it is still a real thing. My opinion is supported by my dictionary (Random House) which gives 21 definitions for the word “thing”. Of these, items 3, 4, 5, 6, 7, 8, 11, 13, 15, 16, 18, 19, 20, and 21 clearly refer to abstract and/or intangible things. Saying that energy cannot be a “thing” is beyond pedantry – it’s just plain wrong. Saying that energy isn’t “real” is like saying that waves don’t really exist, or like saying that rope doesn’t really exist. Momentum is an abstraction, for all the same reasons that energy is an abstraction. Indeed, special relativity tells us that energy and momentum are intimately related. They are the components of a single four-dimensional vector. For details on this, see reference 2. In particular, it would be a mistake to restrict your definition of momentum to the motion of tangible material particles. There is also momentum in the electromagnetic field. It would be a mistake to define “flow” in terms of the mechanical motion of tangible objects. We need a more sophisticated, abstract notion of flow. Definition: Consider some quantity X, which could represent something tangible like water, or something more abstract like energy. Suppose a certain amount of X disappears from one region of space, and simultaneously the identical amount of X appears in an adjacent region. We can safely say that X flowed from one region to the other. This notion of flow is more inclusive. It works just fine for the flow of water, and it also works for the flow of charge, energy, and other abstract quantities. For more about conservation in terms of continuity of flow, see reference 1. Let’s talk about conservation of charge. Charge is not primarily about concrete tangible things. It is much more abstract than that. We can illustrate this point in multiple ways. For starters, note that when the charge in a particular region increases, it does not mean that a positively-charged particle moved into the region. It could equally well mean that a negatively-charged particle moved out. The increase in charge is the same either way. A specific example is shown in figure 9. Suppose we have an electrochemical cell. In the left part of the cell, sodium ions are flowing left-to-right. At some point the sodium ion bumps into a previously-stationary potassium ion. The sodium ion stops moving, and the potassium ion starts moving. Recall that in figure 3, the wave moved from the rope to the chain, but we recognize it as being the same wave. Different substance, same wave. The situation in figure 9 is closely analogous. The left side and the right side have different chemistry, but we recognize the charge as being the same. Electric charge is completely abstract. The laws of electromagnetism do not care about the chemistry; they only care about the charge ... or more specifically, the [charge, current] four-vector. The number of pions is not conserved. The number of muons is not conserved. The number of electrons is not conserved. The lesson here is that if you focus on the tangible, material things, you are going to miss the important fundamental physics. Pions, muons, and electrons are tangible, material things, but they are not entirely well behaved. Electrical charge is an abstraction, and is much better behaved. Here’s another argument leading to the same conclusion: If you have a bunch of electrons flowing left-to-right, it means charge is flowing right-to-left. That’s because electrons are negatively charged. So, once again we see that charge is an abstraction. The laws of electromagnetism have a lot to say about this abstract charge, and very little to say about whatever tangible particle(s) might be carrying the charge. So, once again we see that (a) charge is an abstraction, and (b) our notion of flow is an abstraction, more subtle and more powerful than the mere motion of tangible particles. The sooner you make friends with abstractions such as energy, charge, et cetera – accepting them as abstractions – the better off you will be. As mentioned in section 3, electric field lines are sometimes used to model the electric field vector. Like all models, they have some advantages and some advantages. They are in some ways an apt representation, and in some ways not. What’s more interesting is that the thing the field lines are trying to represent, namely electric field vector, is itself a model, and it is not best available representation of the underlying physics! The E-vector is notoriously not relativistically covariant. It is not even part of any useful 4-vector. The clever way to represent the electromagnetic field is as a bivector. This bivector is relativistically covariant, which means that if you draw a picture of it, everybody (in every reference frame) agrees that is the right picture. This is in dramatic contrast to electric field lines, which different observers would draw differently. In the special case where the EM field looks like an electric field in the x direction in our reference frame, the corresponding bivector has one edge in the x direction and one in the t direction. In the special case where the EM field looks like a magnetic field in the x direction in our reference frame, the corresponding bivector has one edge in the y direction and one in the z direction. Almost all the usual objections to “field lines” can be removed if you build a model of the electromagnetic field bivector (rather than the electric and/or magnetic field vectors). Yeah, I know drawing bivector fields is harder than drawing lines, but it’s not impossible. A number of good examples can be found in reference 3. Some more modest examples can be found in reference 4 and reference 5. You are going to need some chain and some rope with the same mass per unit length. Discrepancies of 20 or 30 percent in the mass per unit length won’t matter much; just do the best you can. Get some light, flexible chain, at least six feet long. you can use ball chain of the kind they use for making pull-cords for overhead lamps, and for controlling certain types of window-shades. Ball chain has the advantage that it comes in a wide range of sizes. I got lucky and found some brass clock chain that was almost a perfect match for the rope I had available. Almost anything will do if it’s strong, flexible, and not unduly heavy. 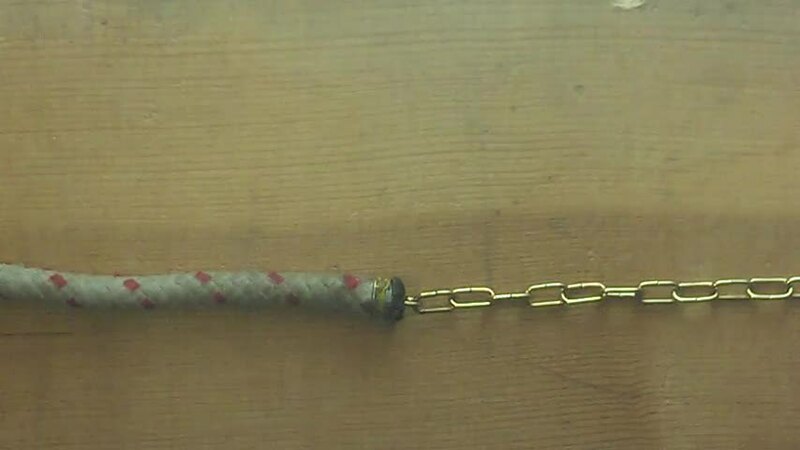 Splice one end of the rope to one end of the chain, to make a combination that is half rope and half chain. Have two assistants hold the ends of the combination, or better yet, fasten the ends to suitable supports. Don’t make it unreasonably tight, just tight enough that it doesn’t drag on the floor or other obstacles. Gravitation (W.H. Freeman, San Francisco, CA, 1973).